I lived in Harlem from 2009 to 2011. As a white, middle-class Englishman I did not fit into the demographic of the soul of black America but there were many great things about living in the neighbourhood, not least the stupendously excellent fried chicken. However, as I furtively watched cricket in my apartment in this stronghold of hoops and home runs, the game seemed about as alien as a local soul food restaurant selling muesli. And yet the story of cricket in Harlem is in many respects a microcosm of the neighbourhood’s history. Northern Manhattan was a rural idyll deep into the mid-nineteenth century, and a place where the wealthy built second homes. By the 1820s a horse-drawn railway offered an easy route in to and out of the city, allowing respite to those who lived in the filthy, dangerous and overcrowded southern tip of the island. One of the central attractions for Harlem’s residents and visiting New Yorkers was to watch horses trot around the course at the Red Horse Tavern on East 106 Street somewhere between First and Third Avenues. It was here that the St. George Cricket Club, consisting mainly of upper crust Englishmen, moved in the early 1840s, and it was also the location of two of the earliest international contests. It was seven years until the two sides agreed to a rematch, which was again played at the Red Horse Tavern ground. 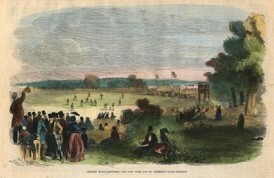 Around 2,500 people made their way to Harlem “by stage, railway and all sorts of vehicles, from a milk waggon up to a trotting buggy” and the crowd went back south happy after the home team triumphed by 34 runs. This victory sparked a new surge of interest in cricket throughout America but it was also the last significant match to be played in Harlem. By 1854 the St. George Club had moved out to Hoboken, reportedly because of the rapidly growing population around the Red House Tavern ground. The ground was used as an encampment by the Excelsior Brigade of the Union Army during the Civil War, and after that faded into obscurity, lost to the changing character of its environs. There were no more cricket matches at the ground, and few more in Harlem, as the war cemented baseball in the nation’s affection and confirmed Harlem’s role as a home to waves of immigrants. First came the Germans, mainly-well educated and quick to assimilate with the locals. By the closing years of the nineteenth century it was the German community itself who looked back wistfully on a Harlem “where one could smoke his pipe and peacefully drink his glass of Rhine wine.” The new residents that caused such nostalgia had fled the grinding poverty of the old country, which was usually located in southern or eastern Europe. Leisure pursuits changed along with the population, with the crowd who used to admire the St. George side becoming inexorably pushed out of the neighbourhood, while few of the new Harlemites were interested in what was for them an entirely alien game. Alongside the urbanization came parks, the most monumental of which was Central Park, just south of Harlem. A cricket pitch was envisaged in the original plan for the park but by the time it was built these designs had changed, and the park commissioners were steadfast in their refusal to host any games. As more and more African Americans streamed eastwards, fleeing their own old country, many found a home in Harlem. By the First World War it had established itself as a centre of black life in the country and was the largest black community in the world. There were dozens of Harlems at this time, for example the Genovese were on East 106 Street, those from Piacenza on the two blocks below this, while the Calabrians were on East 108 and East 109 Streets. The racial, social and ethnic barriers were rarely crossed and were usually zealously guarded but one of the few opportunities to come together was at the Polo Grounds. First built in 1880 then moving four times until its final home on Coogan’s Bluff, the Grounds showcased Major League Baseball, American Football, boxing, soccer and even Gaelic Football. Indeed almost the only sports not held at the stadium were polo and cricket. It must count as one of the most extraordinary match reports in the annals of the game. Garvey’s love of the trappings of colonialism (not just the titles, he often wore an extraordinary gown and feathered helmet), rigid racialism and awful business decisions led to his downfall. Arrested and found guilty of mail-fraud in 1925, for which he blamed Jewish and Catholic jurors, he was expelled from the country in 1927 and never returned. The Garvey-inspired outbreak of cricket in the empire of baseball was also short-lived. Although the Caribbean community continued to play, gradual assimilation whittled it away to near extinction. In his book Harlem (to which this article owes a great debt) Jonathan Gill writes of the “transformative power” of Harlem’s history. That cricket played a role in this, not merely as a plaything of the old elite but also as part of the immigrant experience, is strangely beautiful to this New Yorker.